Our book sales are handled through Ingram Publishing. To order for your store please contact our publisher for prompt delivery. 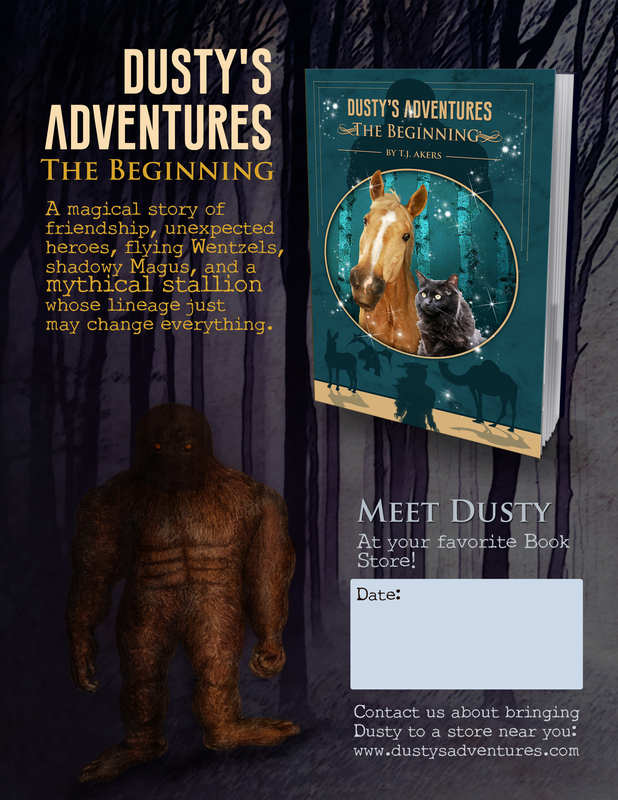 Dusty’s Adventures are accumulative stories based on real events and live characters (with a little magic thrown in!). Dusty arrived at the tender age of two-years-old to live with Mark Peterson. They have traveled extensively throughout the U.S. leading expeditions, as well as escorting television crews and researchers, into the U.S. wilderness. Mark has accounted these tales to author T.J. Akers, who has transformed the stories into a wonderful and exciting book poised to become a best selling children’s series. We welcome you to join us on yet another fabulous adventure! For bios on Mark and T.J. please visit the Adventure Tour page. A Horse at a Bookstore? Absolutely! Dusty has traveled nationwide visiting, bookstores, bath stores, hardware stores, schools, and Ronald McDonald Houses. He’s even had his own kissing booth. Unlike any typical book signing where you meet the author, with Dusty, you get to meet the hero of the book. He even signs his own autographs. Dusty brings something extra special in a 1,600 pound, sweet, gentle, and loving package. He’s been drawing crowds where ever he goes in the US and is excited to round up a heard of customers at your place of business. Imagine the excited faces of children, and parents, gathered outside your store when you announce that Dusty and his sister, Daisy May, are coming to book signings. Dusty’s first book is a charming and exciting adventure suitable for middle school aged youth through young adult, though many adults will love this book as well. The sequence of events is kicked off by an innocent yet very entitled fluff of a kitten named… Kitten! A friendship between the golden Rocky Mountain Horse and the tiny, black kitten is immediately formed. The adventure begins when it is discovered that kitten is being pursued by all sorts of creatures; mystical, magical, mean. But the scales aren’t completely tipped, as Kitten has his loyal friend, Dusty, and powerful others who take great interest in keeping the mischievous kitten safe from harm. It’s not simply a tale of who will win the epic battle, but of all things learned, loved and lost along the journey. Download and print the Dusty’s Adventures poster with the handy area where you can write in the date Dusty will be appearing at your store! Right click the image and select “save image” and then store the poster to your hard drive. The poster can be easily printed on your own printer, or at any photo/print lab of your choice.